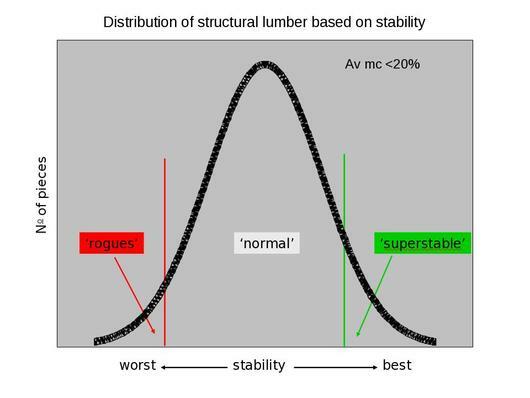 Structural lumber that is near dry (<20% moisture content) can be segregated into three groups - those that are super-stable, average boards and the real problem-making "rouges". The percentages of these groups, for "typical" radiata pine, average around 10, 85 and 5% respectively, as shown in the chart below. Whilst the rouges are relatively few, they have the potential to cause very costly claims and re-works if they warp after installation. In the USA, super-stable lumber sells for a significant premium and comes with a guarantee that walls built with this material will stay straight in service. This is a "certified stable" product. 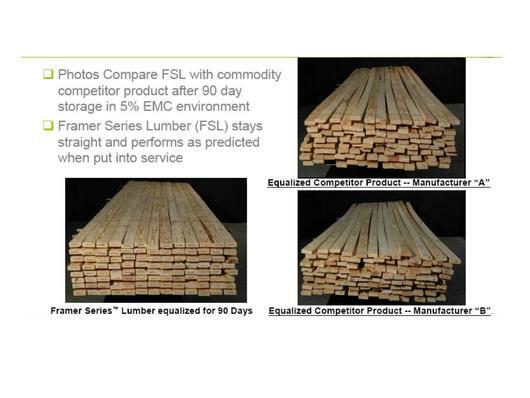 In the photos below the "certified stable" lumber (Framer Series™) [left] can be seen as compared lumber that has not been segregated [right]. One of the great advantages of this development is that it addresses one of the main purported performance advantages of steel framing over lumber framing i.e. stability in service. Now architects, builders and home owners can be confident that they are purchasing lumber framing that will perform as expected in service. The next current research challenge being tackled is to translate the technical success of segregating near-dry lumber to green lumber. This will enable processors to reject the "rogues" prior to putting them through the expensive drying process. This will lower production costs and improve the efficiency of the supply chain; ultimately resulting in increased returns for forest products processors and forest owners. Ultimately we are aiming to be able to assess logs and/or full stems and determine whether the lumber cut is likely to be prone to instability. This will allow the most appropriate processing/saw pattern to be applied and further reduce waste and unnecessary cost.